Monique White celebrates a delay on evicting her from her home. Click photo to watch video. Embattled homeowner Monique White took one more step Friday toward what could become an improbable victory that would let her stay in her North Minneapolis home. At Hennepin County Housing Court, Judge Mark Labine granted White’s legal team a one-week extension in their defense against mortgage holder Freddie Mac. Next Monday, Labine will likely decide whether White will lose her home, or whether she’ll get a jury trial in District Court — which means that her fate will be up to White’s fellow citizens. Monique White is an African-American single mother who works two jobs, including the night shift at a local liquor store. More than half of all homes in her zip code of North Minneapolis have gone through foreclosure, but she is determined to fight the foreclosure crisis and stay. 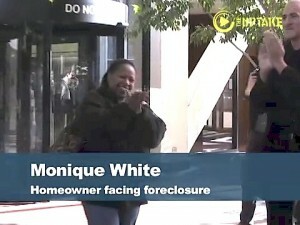 The Occupy Homes movement locked arms with White in early November, defended her house through the winter, and now have joined her in court. Occupy’s other home defense, at Bobby Hull’s house in South Minneapolis, resulted in an improbable victory last month when Bank of America agreed to renegotiate the ex-Marine’s mortgage. Minneapolis' Green Homes North project aims to build 100 ecological homes in North Minneapolis that are based on green standards and do it with local minority and women contractors and locally-sourced green products.